A report titled ‘Mapping the Humanities, Arts and Social Sciences in Australia’ was published in October. The HASS (Humanities, Arts and Social Sciences) disciplines are under pressure. The STEM (Science, Technology, Engineering and Mathematics) disciplines have a high profile and have become more effective and convinced politicians and funding agencies that STEM is critical to economic salvation. HASS risks getting left behind. Yet it is pointed out in the report that 65% of all university enrolments at undergraduate and postgraduate level are in the HASS disciplines, and that HASS research soaks up 16% of national research income and produces 34% of research outputs. However HASS research receives little income from business, and less income from government strategic initiatives than the STEM disciplines. The academic workforce in HASS is a concern. It’s ageing, career paths are uncertain, and casualisation is impacting on career development. The new study argues that ‘Australia has a strong and resilient HASS sector that makes a major contribution to the national higher education system, to the national research and innovation system, and to preparing our citizens for participation in the workforce’ (p 1). ‘Population Ageing: Australia’s Future’ was the title of the Annual Symposium of the Academy of Social Sciences in Australia. The Symposium was held in the dated, but elegant, Shine Dome in Canberra in mid November. It was a big topic, but very well handled, apart, perhaps, from an overload of very detailed power-point tables in several presentations. How many times does that occur! The success of the day was down to Hal Kendig and the Organising Committee, who are to be congratulated. It was stimulating and informative. The presenters and the audience included many of the heavy-hitters in the analysis of aged care issues in Australia, with those from academia tending to be them-selves aged. I spoke to a couple of young Flinders PhD students working on the psychology of aging, but they were in the minority. Susan Ryan gave the Keynote, telling us that the framing of an ‘age crisis’ tends to stymie public policy rather than facilitate it. But there are issues. Australia is one of only three countries with male and female life expectancies over 80. Net migration of about 180,000 per year is providing a small off-set, slightly increasing the proportion of the population under 55. Warwick McKibbin observed that Australia may once again be having a ‘lucky country’ break. While our ageing population, or, as economists say, demographic decline, could be a drag on the economy, the booming populations in the emerging economies have blurred ageing’s impact on Australia’s economy. Three key challenges were put forward by John Piggott: means testing access to the aged pension, while continuing to improve private pensions; improving health care, including by remote delivery; and shifting from residential care to community care. Currently 80% of Australia’s aged are on the Government pension. While there is an increasing tendency for banks and insurance companies to try and retain aged workers, it is quite the opposite in the public sector. The afternoon touched on cognitive impairment due to ageing. Kaarin Anstey highlighted the importance of neuro plasticity which underlines the importance of mental stimulation in sustaining and building mental capital in the aged community. Throughout the presentations I cogitated about how an ageing population might usefully contribute to the development of a more significant knowledge economy. At best, Australia is lagging on this; at worst, we are going backwards, comparatively speaking. The evidence: a frequently expressed anti-science attitude, notably with regard to climate change; a lack of interest in the national broadband network; growing economic dependence on the export of resources; and a retreat from the exploration of renewable energy resources. There are others. Long Jetty’s grunge strip is not only resilient, it is expanding. A year ago I wrote a blog about the small, grungy precinct along the Central Coast Highway between Toowoon Bay Rd and Pacific St. By grunge I imply a distinctive style: it is not a negative term. There were 14 businesses that met my criteria. Throughout most of Australia retail has struggled over the last few years, with vacant shop spaces in many strip retail centres. So on my return monitoring visit this year I was pleasantly surprised. Thirteen of the 14 businesses were still open. Browse About has closed, and will be replaced by an office of Property Central. But the good news for those of us who live around here is there are two new cafes. Green Tangerine and Yummy Thyme! Both have an organic orientation, and are niche businesses. A couple of places I noticed in 2013 were still there, and I decided to add them to the list. Dance Power and Long Jetty Book Exchange both share characteristics with the other small businesses. I can recommend a grounding week in the Flinders Ranges, even this late in the season. The weather was warm, in the high 20s and low 30s, but not inhibiting. On the road up we stopped at Port Pirie for coffee. At Port Germain we walked along Australia’s longest timber jetty, at low tide. And we had a special look at the Port Germain Art Gallery. It was closed but the owner saw us peering in the window and invited us in. The Germain Art Focus group are based at the Gallery; there is quality work on the walls and I bought some postcards. At the Gallery we were told a visit to the Australian Arid Lands Botanic Gardens, located on the outskirts of Port Augusta, is worth the effort. It was fabulous. One of only three specialist arid lands botanic gardens in the world. Excellent facilities too, albeit we were flooded by school kids at one point. A good tasting plate lunch in the visitor centre. We stayed the night in the Prairie Hotel in Parachilna. I drove straight past the access road the first time, figuring the cluster of four or five houses couldn’t be the town of Parachilna. It was. Great experience staying there, with a well stocked bar and a menu adapted to the food supply of arid Australia. The east-west railway line passes through Parachilna. Beautiful to wander around the town at sunset. It takes under five minutes to amble form one end of the settlement to the other. The next day we drove through the Parachilna Gorge and on to Angorachina Village. A sign in front of the shop declared ‘Real People Only. No Yuppies’! Not being sure what qualifies as a yuppie in the Flinders Ranges we didn’t risk trying to get a non-fat soy capuccino and friands, and instead meandered on to Blinman and the Blinman Cafe. There the reception was warm, and we sat on the verandah chatting with the women who ran the place and ate home-made beef pies and drank ginger beer. The next three nights were at the Wilpena Pound Resort, about 60 kilometres to the south in the southern Flinders Ranges. It was an ideal spot from which to explore, coaxing the car along often rugged dirt roads winding along creek beds, and other times up and down walking trails. The sheer majesty of the arid landscape was inspiring. The highlights included Brachina Gorge; the Cazneaux Tree; the view from Stokes Hill Lookout (coinciding with the running of the Melbourne Cup); Huks Lookout; the Sacred Canyon carvings; and Wangara Lookout. Gough Whitlam had a huge impact on me and my generation. He brought a freshness to Australian politics, even though the governments he led delivered a mixed bag of changes. A cultural shift occurred in Australia during the Whitlam years. Politics changed. I began to think that Australia could be a force for policy innovation. Looking forward to a visit to Singapore. In the last week world attention has been on the Occupy Central protests in Hong Kong. Zero chance of something like that in Singapore. On my first incursion into Southeast Asia in early 1975 I landed in Singapore and travelled to Malacca, then Kuala Lumpur, back to Singapore, and across to Jakarta and Bandung. I was scouting for a location where I might undertake PhD research. I later eliminated all the cities I visited, choosing instead Makassar, or Ujung Pandang as it was then known, on Sulawesi. In Singapore I recall: the Cold Storage supermarket in Orchard Rd and the hawker centres that occupied their car-park in the evenings; the junks in the Singapore River; the hotel (Tanglin Court Hotel, maybe) in which I stayed on a hillside off Orchard Rd; the Lunar New Year Celebrations for the year of the Rabbit. Singapore has regularly been a stopover. At one time it was the research links with colleagues at the Institute of Southeast Asian Studies, Nanyang Technology University and the University of Singapore. In the last decade many visits concentrated on Flinders University partners and programs in health services management, nursing, palliative care and clinical rehabilitation. I have also been interested in Singapore’s aspirations to be a global education hub. My most recent paper is titled ‘Singapore’s Global Schoolhouse Plan Faces Challenges’, a modified version of which was published in Oxford Analytica Daily Brief (January 2004). Tony Abbott has made a substantial commitment of Australian forces to the attack on the Islamic State group (the French call them the DAESH, an acronym of their Arabic name). Australia is ‘the most enthusiastic member of the coalition of the waiting’, according to Peter Jennings. Something needs to be done about the DAESH on humanitarian grounds. But it needs a much more significant input from the Muslim countries in the Middle East, especially Saudi Arabia and Iran. The latter has said it is opting out altogether. I’m surprised by the speed of Abbott’s response. Has he learned nothing from the failures of military intervention in Afghanistan and Iraq? I have. It is not the speed or strength of entrance into the battle that matters. It is what happens afterwards. Who is going to pick up the pieces after the US and Australia withdraw? It is assumed that the government of Iraq (and of Syria) will, but it is unlikely that it either has, or ever will have, the capacity. Exiting conflict zones has generally proved extremely difficult for western powers. Abbott has taken a more aggressive and committed stance than any except Obama. And Obama’s only came about after a lot of hand-wringing. There has been little opportunity for serious debate in Australia; Abbott thought it was unnecessary for a full debate in Parliament..
Scotland votes this week. While the support for the Yes vote has held up, the polls suggest the No vote has a slight edge. My views have not changed. If I had a vote, it would still be No. Scotland already gets a fair share of British Government funds. Getting significantly more would do no good, as it would be at the expense of other communities. Instead the reward for the No vote should be a genuine effort to improve the functioning of devolution and address any lingering grievances. A risky strategy, of course, as the politicians are more than likely to grab a No vote and bury any genuine Scottish grievances in the files of a parliamentary committee. SCOTTISH INDEPENDENCE - HEART OR HEAD? The latest YouGov poll has swung back. Overnight the No vote rose to 52%; the Yes vote dropped back to 48%. I’m conflicted about it. My heart says Yes, but my head says No. My paternal great grandfather, Alexander Smythe Forbes, was born in Aberdeen in 1855, arriving in Adelaide in 1879. My maternal grandmother, Flora Stewart McNichol, was born in Peebles in 1884. The family tree is dominated by Scots and Cornish. The Scots in Scotland don’t care what the diaspora thinks, of course. And to be truthful, independence would have very little impact for me, apart from twanging an emotional string every now and again. And I can barely understand English spoken with a broad Scottish accent, let alone speak Gaelic. The prospect of independence for the Scots has created a great wave of optimism and pride, underpinned by the oil wealth generated in the North Sea. The English obsession with the royals must drive the Scots to despair, but that doesn’t seem to have been a major factor. But how long could the euphoria of independence be sustained? It would be a small nation, of a little over 5 million, and without the strategic location of, say, Singapore. I cannot see many tangible benefits of independence, aside from the adrenalin rush. The phoney war over higher education funding changes has ended. The Government’s reforms were brought to Parliament this morning in the form of the Higher Education and Research Reform Amendment Bill 2014. The real fight begins, but it might not be the universities taking the lead. It will be a political battle, with most action in the Senate. While the Government has a majority in the House of Representatives, a complex mix of major and minor party members in the Senate, including the erratic Palmer United Party, ensures the process will be melodramatic. Education Minister Christopher Pyne had been spruiking his proposed reforms for weeks. They distilled down to a few pivotal changes. The deregulation of the fees universities could charge to students, together with a cut in Government funding for courses by 20%. By the Government’s thinking, these offset one another. Universities would get more revenue from students, and less from Government. Together the Government and the universities will be required to establish additional Commonwealth scholarships available to disadvantaged students. The main concern is that it privileges the older, wealthier universities that attract the well-heeled students coming out of high-fee private colleges. The rest of the public universities may well struggle financially, with some not surviving the changes and being forced into closure or mergers. Student loans under the highly regarded HECS arrangement will be repaid at the government bond rate, capped at 6 per cent, rather than as currently at the rate of inflation, which is generally lower than 6 per cent. If the Minister approves a private higher education institution it will be eligible for Government funding equivalent to 70% of the subsidy that public universities receive. A more even playing field for qualified private providers will increase competition and, in turn, may threaten public institutions. Pyne has said that he has the remainder of the year to finalise the reforms, which have a startup date of January 2016. He has also ruled out any axing of research funding. Fears had been mounting that the Government may have taken the axe to research funding if its strategy was blocked. The risk of a drenching couldn’t deter us from a late afternoon trek to see the finalists for the Archibald Prize. There were 884 portraits of men and women ‘distinguished in Arts, Letters, Science or Politics’ entered for the Archibald this year. 54 made it onto the walls of the exhibition. The judges are trustees of the Art Gallery of New South Wales, which helps explain the overwhelmingly large number of NSW artists represented among the final 54. 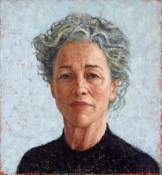 The winner was NSW artist Fiona Lowry’s elegant, ghostly portrait of NSW resident Penelope Seidler. My vote for the People’s Choice Award was Jude Rae’s calmly understated portrait of ‘Sarah Peirse’ (below). For the first time ever, M and I agreed; we both independently thought it the pick of the 54 on show. The others on my top five list, in order, were: Mirra Whale’s portrait of Tom Uren (it could easily have been my first choice); Qiang Zhang’s ‘Here’, the title of his portrait of Yang Lee; Wendy Sharpe’s ‘Mr Ash Flanders, actor’; and Zoe Young’s ‘Torah Bright’. M added a few extra favourites: Fiona Lowry’s ‘Penelope Seidler’; Julian Meagher’s ‘John Waters - the clouds will cloud’; Paul Newton’s ‘Portrait of Frank Lowry AC’; Martin Tighe’s ‘A familiar stranger’ (Emma Ayres); Mirra Whale’s ‘Tom Uren’; and Qiang Zhang’s ‘Here’. Progress on the #PNG project has slowed to the speed of a tar pitch drip. I have been distracted by the work involved in preparing my house for sale, along with an annual contribution to two Academy of Social Sciences’ committees and another short piece for Oxford Analytica. I continue to ponder what my artist’s book on PNG is meant to convey. It is best described as a memoir which articulates how I saw the country through my youthful, naïve eyes, and how this experience shaped me and set a direction that guided my lifetime’s work. I was exposed to, and reveled in, living in a more cosmopolitan environment than in my hometown of Adelaide, albeit one largely confined to expatriates and a small PNG elite composed of students, colleagues and a few public servants and politicians. On reflection, my personal life in PNG was unstable and often chaotic. Do the ends justify the means? The letters I wrote to my parents mask much of the chaos, but reading between the lines has jogged my memory and resurrected forgotten experiences. I had very little lasting impact on PNG, even though I was teaching, and undertaking research and three consultancy projects. PNG, however, had a gritty and profound influence on me. I left the country a little more balanced as a person, with an enhanced and more coherent sense of what my next steps would be. I yearned for greater stability in my personal life, and I knew I wanted to work in a university and teach and research about cities and development in Southeast Asia. The PNG experience is being articulated and represented through a collage, drawing on photos, and other scraps and artifacts from my years living in Port Moresby, and travelling around the country. It helps that I have been a hoarder. A whimsical narrative will accompany the collage; writing has been an organic part of my life. It will all be brought together in a (very) limited edition book. I can visualize it in both a concertina form for display, and in a small number of bound volumes. Unexpectedly I have become interested in the significance of ‘big data’. Perhaps I don’t get out enough. Big data is, by one definition, the three Vs: ‘high-volume, high velocity and/or high variety information assets’. Big data is attracting serious interest from both researchers and the big end of town. The government end, that is. The Australian Public Service Big Data Strategy was released in 2013 by the Department of Finance and Deregulation. In the US the Executive Office of the President this year released its Big Data: Seizing Opportunities, Preserving Values report. Businesses, too, are interested in big data, as the McKinsey Institute is quick to point out. I look at big data from the perspective of social sciences and the humanities. Of course, I appreciate that the scientists see themselves as leading the way with big data. Think the biosciences or astrophysics, where much of the data is already infinitely large and complex. For both the sciences and the social sciences-humanities the reduction in computing costs, increases in the capability of computers, the faster speed of connection and the expansion of cloud storage expands the ability to quickly and economically analyze data. Equally as exciting for the social sciences and humanities is that as society acquires and puts to use a greater diversity in internet-connected technology, the amount of new information being generated increases exponentially. Take mobile technology, such as a mobile (cell) phone, with its numerous apps. Huge amounts of raw data are created 24/7. Phones generate information about who we talk to and where we are at any time of the day, often with pictures. If connected to social media, such as twitter, phones are used to read and document opinions, accumulate news and random information, and distribute text and visual information about social behaviour (including pictures of breakfast). Basical three connected themes related to big data should interest social scientists. 1 Opportunity...for social scientists to address new research questions through new sources of data. 2 Privacy...concerns about an erosion of individual rights. 3 Impact...of big data on methodologies in the social sciences. Big data is here to stay, and increasing numbers of social scientists will base their career on the analysis of large, complex data sets. Policy-makers, particularly those on the conservative side of politics, favour this kind of empirical research. Somehow they think it is less threatening. WILL THE BUDGET AFFECT INTERNATIONAL EDUCATION? The Budget had important implications for higher education, although it was hard to tell from the press coverage. The most significant was a cutback in financial support for universities. Government funding will remain uncapped, meaning if Australian students are accepted into universities they will be supported. However, Government funding currently accounts for about 60% of the cost of a university course; this will drop to 50% in the future. Students will make up the rest. At the same time, fees for Australian students will be deregulated. Universities will be allowed to increase the fees up to the level paid by international students. They will have to recycle 20% of their Australian student fee income into scholarships, intended to support the highly talented, but financially troubled, students. There are some happy Vice Chancellors. The largely 19th Century Group of Eight universities have long wanted deregulation of fees. Located on old ivy-clad central city campuses and getting the lion’s share of Government higher education largesse has made them the destination of choice for the children of the wealthy and influential. Even Labor MPs look to the ivy-clad for their post-parliamentary connections, rather than the universities established since the 1960s. Other VCs will be apprehensive. Universities have committed to annual pay increases of around 3% for the next few years, so there is little room for any contraction brought about by a more open market. Private higher education providers will be energized by access to government supported payments for their students. No one knows how students will respond to higher fees or greater private competition. Serious financial failure among public universities looms as a possibility. With increased competition for domestic students university management is going to focus on how to adapt to the new environment. Some will be distracted by the unknowns of a deregulated environment and lose sight of the fundamentals. Universities with weak reputations/brands, including those with a strong non-metropolitan presence, or located in outer suburban regions, will be challenged. International education is likely to remain a key focus, and will be seen as a way of increasing revenue to offset wobbles in income streams from local students. The need to more intensively compete for both local and international students will encourage efforts to improve the quality of education, identify gaps in course offerings, and improve services to students. The Government makes the right noises about international education, and supports growth in international students. The pre-Budget Commission of Audit proposed the closure of Austrade, the agency responsible for the national student brand, Future Unlimited. Austrade had, however, strong support from the responsible Minister, Andrew Robb, and PM Abbott thought the trade focus suited the Coalition, so the recommendation languished. IS LYING OK IF YOU ARE A POLITICIAN? The Government’s Budget last week was notable for the long list of PM Tony Abbott’s broken election promises. He set the gold standard. Having spent most of his time in Opposition pillorying his predecessor for a single broken promise, it seems that a half dozen or so major broken promises (eg no new taxes; no changes to medical support; no changes to the ABC etc) were always his intention. The voters will get over it; they have the attention span of a gnat. And of course his cheer squad in the media were there for support. Having shown prolonged moral indignation at the change to an election promise by Abbott’s predecessor, they now thought that a lying PM was in actual fact for the greater good of the country. If you haven’t seen it, read this revealing piece by Annabel Crabb. The campaign’s focus on a ‘budget repair’ was the marketing strategy; convince people of this and harsh ideology driven budget measures would be (reluctantly) accepted. It was irritating, but it was possible to see some of the positives that the Treasurer was trying to bring about. Typically my family history and teenage surfing years memoirs have been written narratives. The structures are simple: they follow a conventional timeline with limited extrapolation. In parallel I have collected photographs, maps and other memorabilia, and devised genealogies. Together they add extra texture to the (unpublished) stories. The approach to my current project is different. I am exploring the three years I lived in Papua New Guinea in the early 1970s, but I didn’t feel a narrative memoir was the best way to express it. Instead I wanted to do something innovative that would enable me to experiment with different ways of articulating the nuances and emotional vibrations of those years. Writing would be a part of the work. The other part would draw from the approach of artists. My partner, Marionne, is an artist, and her influence has been important. Watching her work has shaped my thoughts on how artists communicate through their art. I also trail along on visits to public and private galleries, and see the photographs she takes when we amble along the beach or walk through the rainforest. Talking with her has shaped my critical appreciation of the visual arts by giving me an insight into how an artist reacts to light, colour and structure. They, at least, are visible to me. There is much more that I don’t see, but hope I will in time. 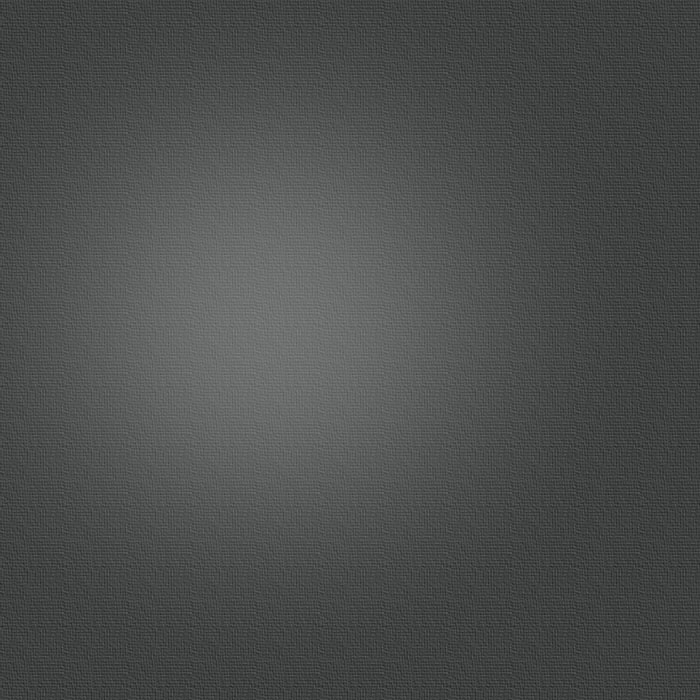 I settled on an approach that merges short-form writing with a visual art form. My intention is to create a different kind of record of the experience. It will combine two elements. A clipped narrative that will be complemented by, and intertwined with, a tangible enhanced visual expression of everyday PNG. I call it an artists’ book, though it is not the same as the artists’ books that I have seen in galleries. The book will combine both my initial experimentation with the form, as well as the final content. In some of my past academic books I included black and white photographs, and other visual material, such as maps and diagrams. But the written narrative was the core. In the PNG project I will sail into unchartered waters. I am composing short texts of 50-75 words. In parallel I’m mining the patrol boxes of documents, books and other acquisitions I brought back to Australia in early 1975, and using them as props as I try to recollect and express the emotional ripples of those three years. The narrative that I write, including an annotated timeline and this blog, are moving along at a reasonable pace. So too is the fossicking through books, old slides, photographs, scrapbooks of newspaper cuttings, and cultural artifacts. Memories, memories, memories. Is anti-science sentiment increasing, and if so, why? The internet runs hot on anti-science views that are often both extreme and vicious. Opposition to climate science seems to have become the mainstream view on the right of politics. Opponents of inoculation aren’t so mainstream, but proponents are doing damage, undermining health programs with proven benefits. And food and nutrition are awash with whacky views about just about everything we consume or don’t currently consume, regardless of any verifiable scientific evidence. Clearly social media provides a substantially expanded way of reaching an audience. A lot more effective than marching with placards or sending hate-mail to politicians and prominent people. The print media, particularly News Ltd newspapers, have muddied the water. Changing Letters to the Editor so that they say the opposite to what was originally intended, writing headers for stories that are deceptive and imply a different argument to that in the article, and generally politicizing almost every significant issue of the day so that it supports one political party. While once the staple of the tabloids, it now characterizes the broadsheets. The loss of credibility of The Australian over the last year or two has been extraordinary. No surprises that it is in deep financial trouble. Scientists are diligently trying to demonstrate the importance of science to modern Australia. Yet for all the worthy press releases, awards, forums and public speeches, progress is glacial at best. In my darker moments I think we are going backwards. Practitioners in the social sciences are often burned by the anti-science critics. Governments, notably in the UK, have taken on-board the criticisms and reduced funding to universities. In the US a powerful lobby wants to end research funding for political scientists. In Australia Ministers have sought to reduce funding for social sciences research. On a positive note, I have been impressed by the work being published on the LSE Impact Blog. I regularly distribute the postings through Twitter. The most recent is an extract by Zuleyka Zevallos titled ‘The sociology of (anti)science: How the social sciences can improve public trust in scientific evidence’. Her focus is on understanding how beliefs, values and attitudes are formed and sustained. It is where the social sciences, in this case sociology, can help to improve the way science is communicated. What are the current themes that social scientists are writing about? I have been reading through the emails about the sessions and the paper abstracts for the combined Conference of the Institute of Australian Geographers (IAG) and the New Zealand Geographical Society which will be held in Melbourne from the 30th of June to the 2nd of July this year. I don’t want to draw too much from this. I posted the information because I wanted to get a feel for what is happening in Australian and New Zealand geography, and to see how much it has changed since I last engaged. The IAG Cultural Geography Study Group has proposed eight sessions (the final eight in the list above), emphasising the strength of this sub-discipline, and its enthusiastic embracing of new vocabularies. Some of the words/memes that are new to me in this context: homonormativities; relationalities; socialities; spatialities; affordances; renaturalization; performativity; post-secular visions’; sedimented; the ‘affective turn’; ‘work precarity’; ‘Agambenian abandonment’; ‘surplus populations’. Some further planned sessions have been announced. That has addressed one of my (four) observations in the initial blog. (20/3/14). Transforming sustainability; in the global south; what does sustainability do? With the PNG component of the Cities of Memory and Meaning project underway it was time to go through my library of Papua New Guinea books. I kept about 50 of the 300 I had accumulated, mostly in the early 1970s, and took the remainder along to Oxfam. I have become a regular visitor to the Oxfam shop, parking in the loading bay in front, and hurrying a boot-full of plastic bags into a lengthy and quite large store-room. Each time it is already overflowing with books being sorted by an army of volunteers who cheerfully welcome the new contribution. My books are organised by region (PNG, Indonesia, Vietnam etc) or organised according to a theme (cities, economic and social development, non-fiction, fiction, and so on). Somehow, I think it is my conceit. Progress on the overall project is slow. I haven’t looked at most of the books since I left PNG in December 1974, so much time was spent on leafing through old volumes, and getting distracted. Now, however, it’s time to look more closely at the books I have kept, and try and isolate the ideas and experiences that most affected me when I was living in Port Moresby. In 1993 a book of short essays by 31 Australian and other expatriate women who had lived in Papua New Guinea was published. 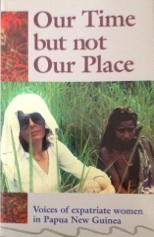 It was titled Our Time but Not Our Place: Voices of Expatriate Women in Papua New Guinea, and it was edited by Myra Jean Bourke, Susanne Holzknecht, Kathy Kituai and Linda Roach and published by Melbourne University Press. I read a few of the essays at the time it was released, then came across it as I collected books to donate to Oxfam. After finishing The Mountain I decided it would be a good follow-up read. It contains some very raw, sensitive accounts of life in PNG. The women generally recognised that they were aliens - sojourners, and not settlers - even though many had lengthy stays and acquired the skills to communicate in Pidgin English. They sought out PNG women and often established close relationships but struggled to understand the complexities of power and local cultures. They sympathized with the hard life of the village women, but respected their strength and resilience. They gained insights into the knotty village cultures and the hardships it imposed on women, especially in child-birth and food production. Almost all spoke of the significant impact their PNG years had on their own sense of self. They retained warm feelings towards PNG, despite the hardships they saw and, sometimes, experienced. 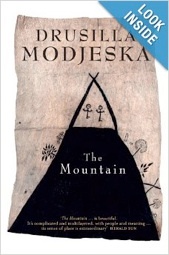 Drusilla Modjeska’s The Mountain (Random House 2012), set in Papua New Guinea, is an absorbing book. Reading it coincides with me thinking about my time in PNG; it was a tumultuous period of my life, as I am increasingly realising. The narrative woven in the book cut a swathe through my memories and emotions. It took a while to get into the story. I read it on an iPad and tracked each new character until I started to get a sense of who and what the story was really about. There is great depth in the writing, and skill and nuance in the interpretation of black and white cultures. Central to it is the human struggle to sustain relationships, and the importance of family and clan in shaping lives. Modjeska undertook an impressive amount of consultation and research in order to write her story, and it subtly shows through in the narrative. From my (white) perspective it has a feel of sympathetic understanding and hard-edged authenticity, and almost no cringe-moments. A large part of The Mountain is set in and around the University of Papua New Guinea from the late 1960s to the early 1970s. My first academic position was at UPNG, from 1972 to 1974. Key characters in the book worked at UPNG in the anthropology department (I was in geography, which gets a mention or two) and lived on campus in Waigani, as I did. It is tempting to line up book characters with real people from that small community. In addition to the University and other settings in Port Moresby (Hohola, Hanuabada), the story is also set in the area near Popondetta, which is referred to as The Mountain. The Mountain is a made-up place. On the map in the book it is somewhere south of Popondetta. I immediately thought of Mt Victoria, PNG’s highest range, which is southwest of Popondetta. Henry Ogg Forbes - not a relation, but from the same area of Scotland as my grandfather - made an unsuccessful attempt to climb Mt Victoria in the 1880s. Forbes was obsessed with Mt Victoria. So, also, many of the characters in the book have their own preoccupation with The Mountain and the somewhat isolated clans that live on its slopes. Why do academics blog? Good question. The short piece in The Guardian argued that it provided the kind of network and experience that might be found in a university common room. Or not. Opinions differ. For me my blog is about developing ideas and arguments - and just writing. It’s practice. The best way of maintaining a level of skill, and improving it, is to keep writing. Followed up by critically re-reading what I have written in the past.